In February Instagram released a new feature to allow you to add up to 10 images and videos to a single Instagram post. They have recently exposed this feature to the API as a ‘carousel’ media type. The plugin now supports this feature. 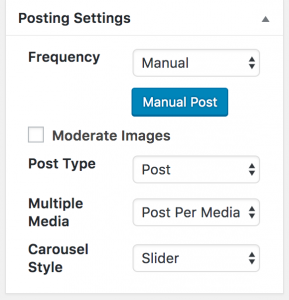 To add a multiple image/video post to WordPress, use the %%carousel%% tags in the account editor. If you post single images and videos on Instagram also, then best to add this below your existing template tags.